As the famous quote by some legend says, "Early to Bed, Early to Rise, Makes a Person Healthy, Wealthy & Wise." 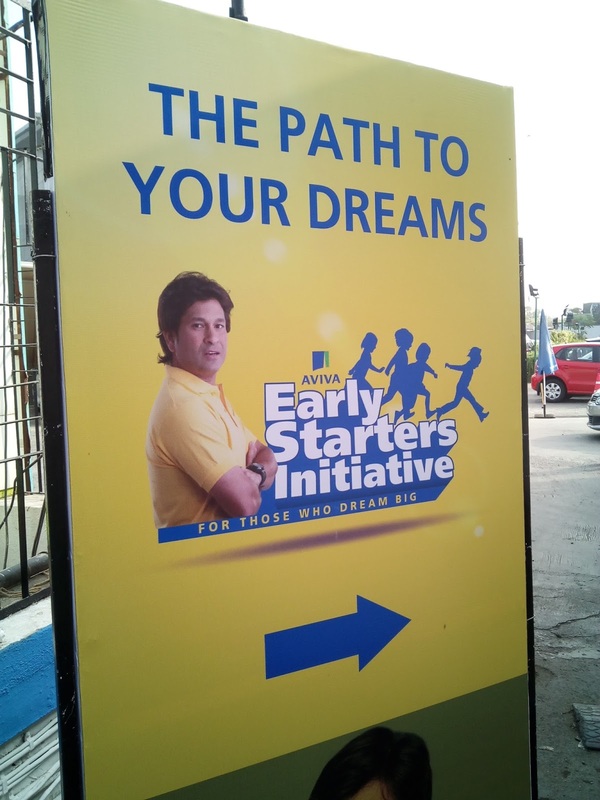 Similarly taking quotes like these, Aviva Early starters initiative was launched by Aviva Life Insurance in early July last year having the primary objective to help students/children achieve their goals & ignite their dreams at the beginning space. This initiative also helps in making parents aware of the situation that starting early doesn't waste his/her child's time, in fact, it helps in building a strong base for their future. So let's dive deeper into their initiative. So what's Aviva Early Starters Initiative? This program as a whole what I mentioned above, trains selected students to pursue their dreams in their teenage. They select about 23 children from 36,000 applicants across our country. Well, the best part about this event is that these particular 23 students would be trained under the one & only Mr. Sachin Tendulkar including other professionals. Whereas some known personalities like Dr. Naresh Trehan, Chef Kunal Kapoor, Fashion Designers Shantanu & Nikhil, RJ Naved, Artist Alka Raghuvanshi & senior journalist Poonam Singh were a part of this mentorship project. The sole purpose of this agenda is to train children from the start so that they could both dream & achieve big. Mr. Trevor Bull, MD & CEO of Aviva Life Insurance also shared his thoughts during the launch last year. Whereas this amazing initiative is going to get a boost due to our Prime Minister, Mr. Narenda Modi since this falls under his similar yet broader International Initiative, "Make in India". Which would further extend this foundation creating more job opportunities. So today at Aviva's event we were blessed to have Mr.Sachin Tendulkar's presence. Whereas Kick-starting today's event, Mr. Trevor Bull shared his thoughts, regarding how India is a country with lots of possibilities & how they'll step on the gas pedal to act as a catalyst in this process. Later Ms. Anjali Malhotra, Marketing & Digital Officer of Aviva India said, "Today Teenagers in India are dreaming big and exploring various careers, but planning to do the same creates a first & foremost barrier which is Educational Cost. Furthermore, she added, "So tackling that wall, Aviva's creating a dent in this space adding various children plan through their advisory, propositions & initiatives like Early starters. Which in turn helps parents in creating a trust over their little one's dream." Few clips on the same were showcased at this event, which took place at certain events throughout this past year. Delivering that fine stroke moment. Then the moment of faith, Sachin Tendulkar took the stage felicitating young children on various niches, depending on their achievements at such young age. Sachin even showed his signature master blaster stroke, while raising bats with small children & trust me everyone went nuts. 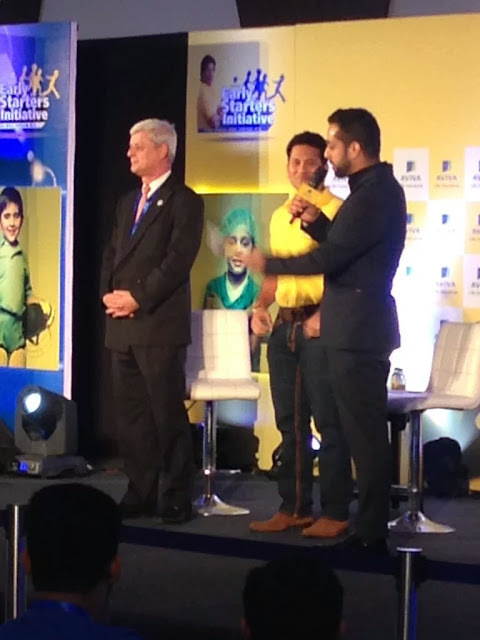 Further Master Blaster, Mr.Sachin Tendulkar commented on this occasion about how he started early just at the age of 8yrs with the support of his parents, how starting this early helped him & how he plans to help youngest kids on the same being the Brand Ambassador of this project. Whereas during the group discussion, Mr.Trevor even stated that, "It's never too late to start." Whereas Salil Acharya being anchor handled this event beautifully keeping enthusiasm in the audience throughout this event. So what should be the takeaways from this event, if you're a student or a Parent? For Parents, it's important to understand that there are various careers options apart from guiding their children to be future doctors or engineers. There's a whole world full of opportunities lying outside, just imagine what if Sachin's parents wouldn't have permitted him to play or practice cricket? So you just need to find what your children are attracted towards & let them have their freedom of choice, what they want to become in future. Supporting your child's dream is what should be the takeaway for parents. Students should dream big, to achieve something even bigger. Youngsters can head over to Aviva's social media channels to get a bird's eye view over their #AvivaEarlyStartersInitiatve. Whereas if you're not on social media, you can push a text stating, Early to 56070. So starting at a very young age can help you achieve something you've never even dreamed of, just look out for some great inspirations such as what I got to witness today in the presence of Mr. Sachin Tendulkar. Henceforth event was concluded in the thought of dreaming big. Finally, Sachin ended his final words stating, "Always respect your elders, because they're the one who will inculcate better values in building you into a better individual."